The South and Central American forest dweller, also known as the brown-throated sloth, spends a large part of its life hanging from its hind legs to reach young, tender leaves growing on the tips of branches, as well as to groom. 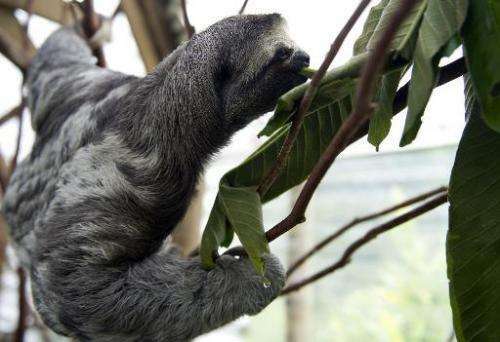 With its slow metabolism, it may take the sloth a month to digest a single leaf, and it can store a third of its bodyweight in urine and faeces—which it deposits about once a week. "This means that the stomach and bowel contents make up a considerable proportion of their body mass," said Rebecca Cliffe of the Swansea Laboratory for Animal Movement in Wales, who co-authored the study in the Royal Society journal Biology Letters. "With their limited energy supply, it would be energetically very expensive, if not impossible, for a sloth to breathe whilst hanging upside down," she told AFP. Cliffe and a research team say they believe they solved the riddle: numerous unique adhesions in the abdomen anchor organs such as the liver, stomach and kidneys, thus preventing them from pressing on the diaphragm when the sloth is inverted. "These seemingly innocuous adhesions are likely to be important in the animal's energy budget and survival," said the study. They could reduce a sloth's energy expenditure by 13 percent, added Cliffe. Your title editor does not understand evolution if he/she thinks "design" is correct. What was the editor thinking ? ?